Comes the news of your arrival. Fusing the conscious with the unconscious. The night goes silent, draping a blanket of darkness. To give meaning to my worship. Note: Every autumn, as Durga Puja, the biggest festival of Bengalis, approaches, a certain delicate flower blooms quietly in the night, spreading its soft fragrance all over. Since my childhood, this tropical bloom has awed me with its magical essence. 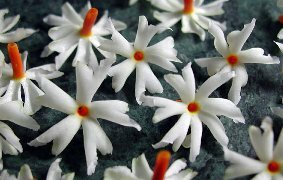 In Bengali, we call the flower Shiuli or Shefali. Disclaimer: I am not a poet and don’t claim this is poetry. It’s just a spontaneous expression, triggered by memory. Just came across your blog. Good stuff, I’d say it definitely is poetry. I’m looking forward to Durga Puja too. I didn’t know Shiuli was called Shefali also! Time to tease my friends with that name! Hey, thanks, Bhaswati! Glad you liked it! I look forward to dropping by often. Thanks for your lovely comment, Shubho! I have heard so much about the dyeing of clothes using the stem (or your corolla :)), but haven't actually seen that done. Agree with your thoughts on clearing the weed to beautify the garden. Would you believe it, I once had a dream that featured a garden of, yes, weeds! One of the most enchanting dreams I've ever had. Shubho pujo to you! Wow, a garden of weeds! Love the idea! Leonard Cohen would love it, as he once said, "Weeds are flowers that no one collects." And he also said, "Poetry is not a form, or occupation…that lines don't reach the end of the page is no guarantee. Poetry is a verdict." So my verdict: yes – this "spontaneous expression, triggered by memory" is most definitely poetry! And yes, shubho pujo to you too (though I hate festive seasons in Bengal when my name becomes a plague)! Thank you so much for your time and observations, Nalin ji. I am touched. So good to see you here despite your busy schedule. Hi Bhaswati, an award awaits you at my blog. Lovely piece and lovely flowers. We call these “Parijatham” in Tamil. Just discovered your blog. It’s wonderful. Thanks, Agnija! I learned the Tamil name of this flower a while ago through some FB friends. Such a beautiful name. Thanks for your kind words on my blog. Yours is wonderful too!